Located in the heart of London’s financial district, this restaurant has a sleek, modern feel that’s similar to its sister restaurant in SE1 but on a much larger scale. The atmosphere is buzzy and sophisticated perfectly complimenting the contemporary decor. The decor is modern, sophisticated and incorporates an open-plan dining area with intimate booths. There’s a stunning marble bar and retro dance floor. Overall, the feeling is smart modern, with confidence in the kitchen and expertise in the service. The impressive marble-topped bar serves a wide range of draught beers, wines, spirits, cocktails and soft bar snacks. The events manager is happy to provide group menus, and the friendly staff will work with you to ensure your event is perfect in every way. 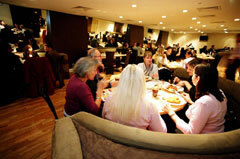 The restaurant can accommodate 300 people and has flexible private dining areas that are available for hire. These sections can seat 50, 70, and 120 guests to accommodate stunning launches, receptions, Christmas bashes, business lunches/dinners and hen and stag nights. * Breakfasts are for groups of 10 people of more and must be reserved in advance. The modern British menu plays host to favourite staples of the largely seasonal menu with a good selection of what they call Best of British and a huge wine list. Save room for dessert, though choosing is difficult. For lighter bites one can try the bar menu.